A cool-sounding delay with classic voicing and enhanced performance capability. 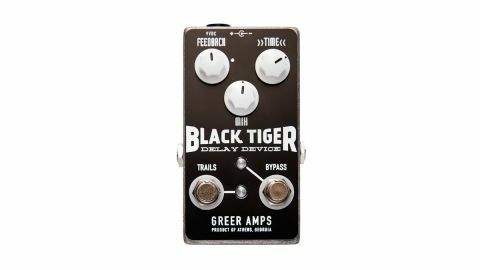 The Black Tiger is a hybrid delay pedal that combines an analogue signal path with a digital delay repeater circuit, the idea being that you get digital accuracy combined with analogue warmth. Standard controls for delay time, mixing the wet signal with the dry, and the number of repeats (feedback) dial in your sound, which ranges from metallic reverb through doubling and slapback to about a half-second delay with vintage-voiced repeats that get nice and grainy as they decay, melting into the background. The secret weapon here is a Trails footswitch. While the bypass footswitch cuts the delay dead, hitting Trails lets the repeats continue and die naturally while you play over them with the dry sound. You can play over a continuous sound if you set delay up for self-oscillation - something that’s aided by the Feedback knob having a useful mark showing you the point at which this happens.